THE hearing into the alleged murder of British tourist Peter Falconio has been closed to the public. Magistrate Alasdair McGregor has closed the court for part of the testimony of Falconio's girlfriend Joanne Lees. Mr Bradley John Murdoch, 45, is facing a committal hearing in Darwin Magistrates Court charged with murdering Falconio and the alleged, unlawful assault and deprivation of liberty of Falconio's then girlfriend Joanne Lees on July 14, 2001. The court was closed after a deal was struck between CH9, the prosecution and the defence. "We are going to deal with something now which will be, in my view, most prejudicial and I propose to close the court for it," Mr McGregor said. The closure of the court came despite a ruling by the NT Supreme Court earlier today upholding a ban on the media reporting some details of the hearing. Ms Lees today resumed her testimony about the night her boyfriend disappeared on July 14, 2001. 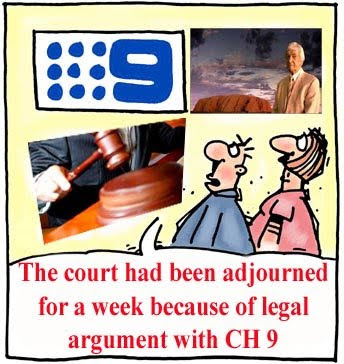 The court had been adjourned for a week because of legal argument with CH 9. She has told the court how staff at the Barrow Creek Hotel and the two truck drivers looked after her after she was picked up on the Stuart Highway on July 14, 2001. At the hotel, Ms Lees said she spotted a dog, similar to the one her alleged attacker had in his van, straight away. "I asked the girl who owned the dog what breed of dog it was because it ... was the same breed of dog as the one the man had," Ms Lees said. "She told me it was a blue heeler dog." Ms Lees told the court the dog was in the front seat of the man's vehicle when he pushed her into his van. Mr Murdoch, who has spent much of the day with his head down reading, stared at Ms Lees with a half-smile, shaking his head as she talked about the dog. Ms Lees was also asked to identify several pieces of clothing she wore on the night, and explain how she received injuries to her wrists and knees during the alleged attack. She was also asked to identify a photo of the home-made handcuffs she was allegedly, restrained with, and demonstrated for the court how her hands were allegedly bound. Ms Lees appeared composed and calm during her most of testimony, and only glimpsed at Mr Murdoch briefly during her evidence. And the Australian ruling class will lock up and frame-up, for 'life', anyone for a crime against any 'backpacker or holiday maker from overseas' no matter whether they were 'guilty or not' and no matter whether they 'found any dead bodies' or whether they found any 'weapon that killed a tourist' and even if there is only 'flawed circumstantial evidence' and 'trial by media' to prove their case. The inbound and domestic tourism industry contributes $70 billion to the economy and employs 500,000. The stalled committal hearing of the man accused of murdering British backpacker Peter Falconio will resume today after CH/9's DPP challenged the Magistrates suppression order.